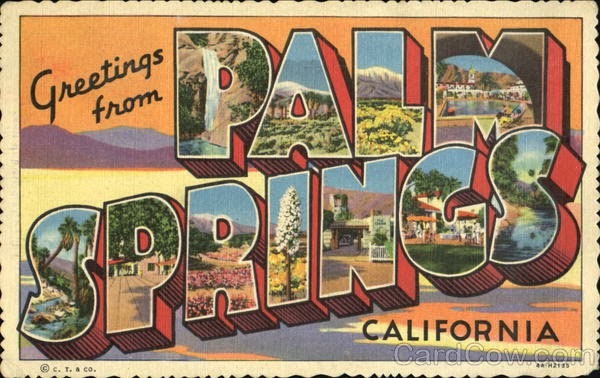 What Can You Find Online about Palm Springs? From its Native American and Mexican roots through to its 20th-century resort and Hollywood days, to its current modern incarnation as one of the coolest towns in America, Palm Springs has always been at the vanguard of American culture. It’s most recent incarnation as the go-to desert resort for the SoCal crowd, largely due to the nearby Coachella Music Festival, has brought it to the attention of an entirely new generation. Luckily, this history has been captured throughout the generations by photographers, artists and the general public photographing the people and places of Palm Springs. If you want to either look at the fascinating past or own or collect photos of Palm Springs history then there are a few places you will be able to get to know the city’s past. The internet is the best place to start looking for old photos, especially if you are not in the immediate vicinity. A simple Google image search of ‘Palm Springs’ will bring up hundreds of thousands of photos, some of interest, some not. By narrowing your search you can get down to just the images of the Palm Springs past that you are interested in. ‘Palm Springs vintage photos’ brings up a great array of oldies, mostly postcards from the peak 50s and 60s era. If you want to find more specific images then photo-sharing sites like Flickr are a good place to find images from individual collectors. Though some people restrict the use of their photos so you can ‘look but don’t touch’, others are more than happy for you to enjoy their photos as your own so you can copy them onto your own photo blog like this or use them in any way you wish. A great new feature of Flickr is Flickr Commons, where they are cataloging all the photos from the world’s public archives. A search for ‘Palm Springs’ in this archive pulls up a wonderful photo of Albert Einstein from the Center for Jewish History enjoying, or possibly not, the Palm Springs winter sunshine. These photo archives are a wonderful repository for images that span both the local and the global. For the Palm Springs historian this is just a photo of a world-famous scientist in their town. But it was taken days after Hitler seized power in Germany, essentially exiling Einstein form his home country. A few weeks after this photo he would travel to Europe to talk about his work, staying in UK university cities of Oxford and Manchester to discuss new technologies, but would never again set foot in Germany. Another option is to cheat. Palm Springs is lucky in that a lot of its famed mid-century architecture has stayed intact and the town has remained unique, unencumbered by strip malls and giant office buildings. Therefore, in some ways it looks the same now as it did 50 years ago. You can hit the streets with a high-end DSLR camera and come away with almost the same image as your grandfather would have, albeit with a higher dynamic range and 100 photos of the same building instead of one to choose the best from. These can then be Photoshopped afterwards to give them that vintage feel. As the cameras on smartphones become more and more capable, people are using them as their main camera and shying away from carrying around cumbersome rigs. A great app on smartphones is Instagram, which allows you to add a number of filters over your photo to give them that 50’s look. The Kaufman House is the perfect Palm Springs icon, ripe for Photoshopping or Instagramming. If you are a Palm Springs native then the local antique stores are a good place to start looking for photos that might be one of a kind. Hidden away between the tea-sets, tables and vases is often a small box of local photos. They might be pricey, as these shops generally are, but these are normally photos of very high quality that you will not be able to find elsewhere. The local markets sometimes have stalls specializing in old photos of the area. They might have been collected over decades and traded, or come from a larger estate collection that is being sold on. Either way it is a great place to find a gem and even if you don’t come away with anything, it is still a great way to while away a morning in the Palm Springs air. Often people neglect the experts that might be right next door. History groups run by enthusiastic amateurs are a great way to get started in local history and will often know about photos, images or stories that have been nearly forgotten. Remember, not everything is on the internet. Some memories are still locked away in the minds of the people who have lived in the area their whole lives. If are lucky they might bring out their photo collection for you. Copyright 2007-20012. Simple theme. Powered by Blogger.